In spite of the fact that we could have continued traveling south along 101, we decided to take the quickest route to the desert. From our overnight at Camp Roberts we turned east at Paso Robles toward the dreaded Interstate 5. For the first time, the central coast was thick with dirty air, something I had never seen in this area, and as we continued east toward the Great Valley, the pollution got worse. Highway 46 was busy with traffic, and a surprising number of RV’s were headed west. The landscape was dramatic in it’s lack of drama. The annual grasses of the California grassland zone were shades of tan and gray, with nothing to punctuate the hills except a few cattle here and there. With the brown tinge to the air, it made the grasslands all the more drab. Ugly is relative, however, and when we reached the Lost Hills area just west of the I-5 onramp, we saw landscapes that were impressive in their ugliness. The alkali flats west of Bakersfield would be bad enough without man’s intervention, but the forest of oil wells made it breathtakingly ugly. I felt a bit guilty complaining about the ugliness while I rolled through it in an RV sucking gasoline. How to reconcile that disconnect? I haven’t a clue. I hate what oil does to our country, the wars fought over it, the landscapes destroyed by it, but I love my RV and the freedom to travel. Hypocritical as heck, but I probably won’t stop traveling! Once on the five, the pavement again deteriorated while the air pollution got worse as we approached the Grapevine. I reminisced with Mo about the days back in the 50’s when my family would leave Duarte at 2 am to drive the Grapevine when it was truly a grapevine of curves and steep hills, traveling north on Highway 99 for our annual camping trip to Yosemite. Good memories! I also remember driving the “new” Grapevine in my Volkswagen bus as a brand new driver scared to death and surrounded on all sides by semis. It was the same today, semis on all sides. We took a quick exit off the highway for signs claiming “fresh sweet oranges” and the small family farm store and petting zoo. The Murray Farm had 20 varieties of citrus, all from their own groves, and the navels were just in. The owner said that they were six weeks late this year. There was a cooler with samples for all varieties including Meyer lemons and a very strange looking fruit called Buddha’s Hand, actually citron. I had no clue that the stuff in fruit cakes came from something that was this strange. I settled for a six buck bag of incredibly sweet navel oranges and we were again on our way. As we climbed the grade, the smog began to thin a bit, and we were spared the worst of it by turning east on Highway 138, a direct road to the desert and the town of Lancaster. I lived in Lancaster in the 60’s, for just a few months, and for the life of me I couldn’t find a single thing that looked familiar. This sleepy town that once was barely 50,000 has now exploded to a strip mall metropolis of more than 150,000 people. We thought about boondocking somewhere, but the landscape was broken up by private “ranchette’s”, and we didn’t have a BLM map with us. I pulled up the AllStays web site and began searching for campgrounds. There are surprisingly few places to camp in this area, but we found a state park due east about 17 miles from town and decided that 18 bucks for a dry campsite would be a close second to camping for free somewhere in the desert, and probably safer. It was a great choice. Saddleback Butte State Park campground was completely empty except for a camp host. The park had shelters for the picnic tables, fire pits, water available, and even a dump station. We chose a spot near the northern part of the park, farthest from the camp host ( whom we never saw) and settled in. An evening walk before sunset was perfectly quiet and we found beautiful Joshua Trees bigger than any we have seen. The park is a haven for desert wildlife, including the desert tortoise, various snakes and rodents, coyotes and even mountain lions. As night fell, the silence was perfect, the skies dark with a new moon, and the stars were brilliant. I brought some soup from home that made a perfectly simple supper and we settled into to complete darkness and silence for our first night in the desert. For the rest of the photos, including several shots of the Saddleback Butte campground, click here. Oregon is beautiful, even in winter, but sometimes the desert calls and we just have to make the journey south to find that unknown “something” that is tucked away in desert landscapes. The trouble with this plan is that the deserts that are warm enough for winter camping require the long journey south through California. I have stories to write, thoughts to put down, but tonight I am worn and the writing will come later. In the mean time, I am listening to the desert silence east of Lancaster where we are the only campers in a park containing 44 spaces. I need to go outside in the deep darkness and check the night skies, I need to listen for coyotes. Several hundred miles behind us now and we are slowing down, stopping to breathe and listen and be still. The desert does that. There are two major routes available to travelers attempting to traverse the length of California. I-5 is a straight shot from Oregon all the way south, fast, and unless you are skilled at paying attention to fine details, incredibly boring. Highway 101 on the other hand, is gorgeous, a winding road that narrows to two lanes fairly often, and skirts the edge of the Pacific at least part of the way. The stretch I drove (hence no photos) all the way from Trinidad, through Eureka into Willits was paradise, and then things started to shift. The traffic got heavier, the drivers more aggressive, and we realized that we were no longer in heaven, we were in “the Bay Area”. Stopping on the side of the road near San Rafael, we switched drivers. Having lived south of San Francisco in Monterra for 25 years, bay area roads are familiar territory for Mo. She negotiated the lanes and the cars over the Golden Gate Bridge while I shot photos from crazy angles and navigated our route with a combination of the iPhone, the NUVI GPS, and the internet. Yes….the internet. A week or so before we left, I decided to purchase a nifty little gadget called MiFi from Verizon. Last fall Laurie and Odel had theirs with them when visiting Rocky Point and it worked just fine. For a long time, high speed internet was an impossible dream out there in the forest, but lately a new tower has given us the delights of cell phone service. We still don’t have cable TV and my only option other than dial-up for the internet so far is HughesNet satellite, an expensive and fairly cumbersome system. Amazingly, the MiFi works great and I can actually do my work with it. And! it travels!! Yes!! So far, it travels quite well and I have been having all sorts of fun doing internet stuff on the computer while Mo drives down the road. As we passed through San Francisco, I spent a bit of time searching out places to get cheap gas, found a restaurant to get some supper, and did some internet searches of possible boondock locations for Wednesday night in the desert. Thanks to Laurie for testing the Rocky Point Verizon bars, and to Randy for sending me a great email detailing how well the MiFi has worked for him while on the road. For some reason, when planning the trip with Streets and Trips, I decided that we could make it to San Miguel in a day. I don’t remember seeing that it was nearly 500 miles, only that we could stay at the Camp Roberts Military Family Camp for ten bucks with full hookups. As the day progressed, we thought a few times about stopping earlier, but once we hit the bay area there really wasn’t a reasonable stopping point. Mo did great, much better than I can do driving in the dark, and we pulled into the camp around 8pm. Now describing what it is like to drive into Camp Roberts in the dark is almost impossible. It is about two miles from the gate to the campground, and there is no light at all, and the road meanders around a portion of the camp that has been abandoned. Once we arrived, our reserved site was waiting, and setting up went smoothly, even with the tiny flashlight. No TV, and of course no internet, except I am now armed with Verizon and I had five bars of rip roaring speed. Amazing! There are 22 sites in this camp, and there are absolutely no frills, but who cares?! I think we have paid ten bucks just to dump, much less camp. The highway runs parallel to the campground and is a bit noisy, but on a mid week dark night this time of year it wasn’t much of a problem. I read a scary post recently from Janna and Mike where someone attempted to hijack their toad while they were sleeping in the rig! Sure made me appreciate a reasonably safe place to park! We slept great and woke up early to 27 degrees showing on the thermometer and before the sun was all the way up it had dropped to 24. That is F, not C by the way. UhOh. Even though our little electric heater kept us cozy for the night, the outside water hose was frozen solid. We still had plenty of water in the fresh tank and within a short time the sun brought the temperatures up dramatically. Mo thawed out the hose with the hair dryer, we cooked a good breakfast, and took our time getting back on the road since the day ahead was to be a short one. San Miguel and Camp Roberts are just a few miles north of Paso Robles and our route east toward I-5 on highway 46. It was a fine stop for one night, but I surely wouldn’t want to actually camp there for any length of time. As we left the camp, I took photos of the abandoned buildings, and only in the distance did we see some nice buildings in good repair that were still in use. Mo did training at this camp back in the 80’s when she was in the Army Reserve, but she didn’t recognize much of what was left. Our departure from Rocky Point seemed easy. With hugs all around in the morning, and daughter and grandson on the road back to Portland, we left Christmas behind us. Without a speck of snow on the road at home, very little snow even on the pass at 5,200 feet, and clear skies to the west, the drive was simple. The prediction was for a huge rain storm to pummel the northwest, but we slipped out of town just in time to miss the entire thing. The drive to Brookings is beautiful and simple, with only a short stretch of interstate between Medford and Grants Pass and the beautiful highway 199 through the Illinois Valley and along the Smith River to the coast. Reaching Brookings in mid afternoon, we were happy to see that the MoHo was still safely tucked away without any unexpected mishaps. Except for the smell. I think I have read a lot about strange smells in RV’s, but we were sure that something had died in there. Mo checked all the mouse traps, the cupboards, and the basement, but found nothing. It didn’t smell like sewer, it smelled exactly like a dead thing in the wall. We opened up all the windows, turned on the fan and drove across town to Freddy’s to gas up with our ten cent discount. By the time we got there, the smell was almost bearable, but I surely wasn’t happy about it. I kept thinking something must have found it’s way into one of the waste water tanks. The other moment of truth was when Mo hit the button to turn on the lights and…nada…nothing….not even a click. We tried the generator startup, again…not a click. Oh. yeah….we are supposed to hit that switch that takes the system out of storage and puts it back on “use”. Duh! Then after filling up we tried to hook up the baby car and hunted and hunted for the electrical connection cord that we keep under the drivers seat of the Tracker. No cord. Mo couldn’t figure out why in the world she would have taken it out but it was nowhere to be found. Until….she looked in back of the spare tire holder on the MoHo and lo and behold, it was right there where we decided last trip that it could stay all the time. Duh again! I guess that is what happens when we have almost two months between trips. As Mo said laughing, “Stupid Us”. After a few hours of driving, the tank smells seemed to dissipate completely and with some extended reading we figured out that maybe we need to add something to our gray water tank the way we add to the black water tank when the rig is going to be stored for any length of time. Lots of folks out there have lots of suggestions about all this, so next time, (if we remember) we will be sure to follow some of those suggestions. AKA…water softener in the tanks, maybe some bleach down the drain, and who knows what else. I’ll have to go read again I guess. We thought we might reach Eureka on the first evening, but then decided that it would be nicer to boondock somewhere a bit sooner since it was getting dark. I hate to pay for an expensive park when all I plan to do is sleep! I pulled up my trusty AllStays Camp and RV app on the phone and found a free OP site (overnight parking) within a few miles of where we were, near Trinidad, California. 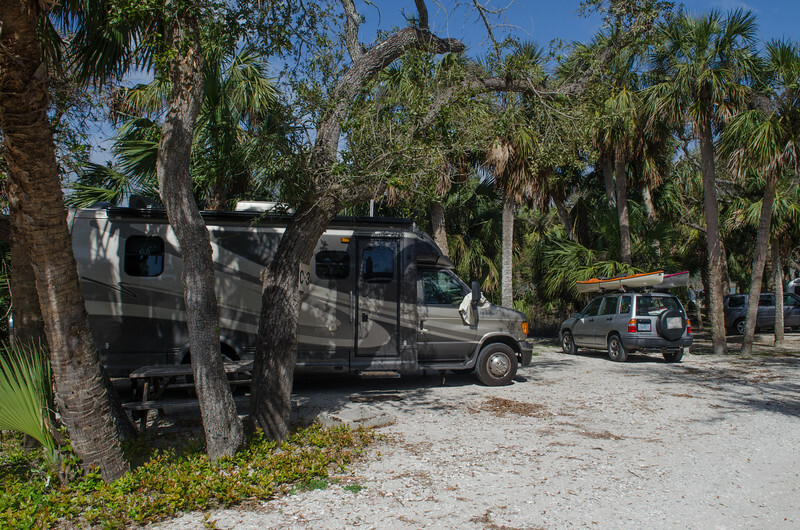 Within minutes we were comfortably parked in a very brightly lit casino rv lot, with a faucet for potable water if we needed it and very few folks around. A quick call to the Chere-Ae Casino confirmed that parking was free and we didn’t need to check in. It was late and dark by the time we arrived, so we managed to park for free without spending a single cent at the casino, in fact, we never even went inside! I am writing this post from the comfy MoHo sofa waiting for the frozen water hose to melt. Of course, we are in California and it dropped to 25 degrees last night. Silly us. We saw rumors of freezing temperatures but kind of ignored them. Couldn’t be THAT bad, right? We are on the road again, but instead of writing about the trip (that will come in the next post), I wanted to write about Christmas. As the years go by, how would I ever remember where we were and what we did if I missed blogging it?! For the first time I can remember, there was no snow in Rocky Point for Christmas. We had a month of gorgeous sunny clear days, short as they were, and cold temperatures, but not a single day of plowing or shoveling. It made for a good month for me to spend time decorating the house inside and out. Two comments from the day made it all worth while. My youngest said, “Thanks Mom, it finally feels like Christmas to me”. And my oldest said, “Thanks Mom for a true “mom” Christmas”. The lack of snow made travel easier for everyone, and Deb and my grandson Matthew drove down from Portland on Friday without a hitch. It was wonderful having two nights with them here before Christmas, with time to just hang out together, eat good food, watch a sweet little movie, and have time to talk. Then on Christmas morning the rest of the local family, with Melody and Kevin, grandkids Hillary and Elric, and my sister Sally and my niece Savannah arrived early for our traditional family breakfast of eggs benedict. The house was warm and festive with family all together laughing and talking and sharing stories. Something that happens all to rarely it seems, so I treasured every single moment of the entire day. After breakfast we opened packages and a highlight for me was the soft sculpture coyote that my granddaughter Hillary made for me. She couldn’t find a pattern so she just designed her own, personally designed and hand sewn. Hillary is an artist who spends much of her time drawing, so somehow she had the ability to picture something two dimensional turning into something three dimensional. Amazing to me, since I am the one that always had trouble with those shapes tests! Vocabulary and reading skills off the charts for me and forget the mechanical stuff! I failed miserably. Since there was no snow, we settled on another family walk through the Rocky Point neighborhoods, amazed at the 40 degree temperatures and light skies. I hear that winter is coming with a vengeance this week, but lucky us, we missed it! Most of the family left just before dark on Christmas Day, but Deb and Matt waited to leave for Portland until Monday morning, just in time for Mo and I to pack up the baby car and leave Rocky Point behind for two weeks of traveling. Of course, most of you know to hover over photos to see captions and click to enlarge the picture. For family who want to see the rest of the photos, click here for the web album on Picasa. It seems that these albums are also viewable on Google Plus for plus users as well. I made them visible to anyone interested. Once all the Christmas hoop-de-do died down, I had some time to read some of the blogs and see all the wonderful Christmas posts from everyone. Beautiful. A belated Christmas to everyone and thanks for being part of my world. Checking it twice. Christmas is almost here and it is time for the final lists: groceries, gifts sent, gifts still in the waiting, cards? yes or no. All the little details that go with this season. After two weeks off while I traveled to Florida, I now have two weeks working full time in order to prepare for our two weeks coming up in Desert Hot Springs. Something about this plan isn’t working that well. It seems as though all my time is spent working or traveling. Where oh where do I find the time for the baking, the wrapping, the decorating? the Open House? All those special little pieces of the Christmas holiday that make me want to spend it at home in Rocky Point. The snow?? A mixed blessing, of course, with icy roads and shoveling always a part of it, but this year the snow has evaporated and no new snow is on the agenda before Christmas day. Nights are clear and cold and days are brilliantly sunny. It is gorgeous, but surely doesn’t look anything like Rocky Point at Christmas. We even had the amazing gift of a perfectly clear dark morning to view the total eclipse of the moon. I packed up the camera and the tripod and Mo drove while we searched for some open sky among the trees. The temperature gauge in the truck read a clean 7 degrees F and my fingers had a hard time finding buttons on the camera in the dark. Still, we watched in awe at the heavenly sky treat, punctuated now and then with a shooting star to make it all the more dramatic. So far, I seem to have at least managed the decorating part of Christmas at home. Mo and I have a lifetime of accumulated Christmas “things”, and as usual her collection is much smaller than mine. We agreed that anything that we couldn’t find a place for this year would get passed on, either to my kids if they want it or to Goodwill if they don’t. Needless to say, there are little treasures that have been tucked into places where we might not think to put any decorations, just because we want to keep the particular item. We are sticking to the rule: If there isn’t a place for it, it goes! Case in point: all the Disney decorations that Mo had tucked away for at least 25 years. I put them on the little white tree with white lights and we set it in the laundry room next to the cat food. Works just fine with the white appliances and I think that Jeremy likes the lights while he is eating. Lucky for me, we also have porches where things can go. We have managed to eliminate several boxes of “stuff” and when we get back from the desert in January, the packing up of Christmas should be easier than it has in the past. Yeah, I still have my village, but am giving away a bunch more stuff when Christmas is over. I still have a tree inside the house, with my pears and partridges and special ornaments, and Mo still has all her keepsake ornaments from around the world on the green trees on the front porch, protected from weather and lit up at night. It all works. I will have at least part of my family here for Christmas. Oldest daughter and my grandson are coming south from Portland for Christmas Eve and Christmas Day this year. Youngest daughter who lives in Klamath will be here with her family. Sister and niece might drive out if the snow continues to wait till January, she has 2 wheel drive and is scared to death of snowy roads. Middle daughter is hauling jet engines around the country with her husband in their big rig and will be here in spirit. Holidays off are not part of their trucking life right now. Son and his wife are tucked away in Missouri and a trip west in the winter won’t be on the agenda any time soon. Grandson and his wife and my great grandkids will be in Texas. Other grandson will be going to his father’s family up in Washington State. I have no idea when or if I will ever again have my entire family in one place at one time. I’m just grateful for the internet, email, and telephones to make keeping in touch with everyone so much easier. In the midst of all this fun, I am finally knitting a sweater for my trucker daughter. I have had the yarn for almost two years now, and this time the promised sweater may get finished by her birthday at the summer solstice. Ah yes, I am NOT a fast knitter, especially with all these other projects in waiting. My quilt is sitting in a bin in the closet waiting for another chance to set up the sewing machine. Cookies and tarts are waiting to be made, and I found an online recipe for my favorite goodie from Starbucks, “Cranberry Bliss Bars” that will find their way into my Christmas pile of sweets and savories to share with the family. I love Christmas. I plan to keep knitting, keep cooking, play some carols on my piano, and enjoy every single minute that I have with family and friends and sparkly lights in my living room. A dozen years ago, a great soil survey project leader and I had a joke. If a woman collected rocks at 3, refused to come inside out of the rain, and loved mud pies, she had the makings of a soil scientist. When I first traveled into the world of soil survey in the 70’s, women soil scientists were rare. Times have changed, and more than half of the young soil scientists in the field are now women. I had the pleasure of working with one of these dirt loving young women when I managed my last project in the foothills of California. Of course, we insiders know that “dirt” and “soil” are two very different things, but sometimes insiders lovingly refer to our particular specialty as dirty. AKA, the bumper sticker that says “Do It In The Dirt” and other such silliness. Alison came to me by way of Chicago, detailing to California to map soils when we were bringing people in from all over the country to help complete soil survey in areas as yet unmapped. Most of the eastern and central parts of the country have existing soil maps, but out west there are many areas with no certified soil information available. Alison came with enthusiasm and energy and brought a great work ethic to Sonora. Her nickname was “Scoopy”, since not one of us could dig a hole as fast as Alison, guys included! Of course, the fact that she has run 10 marathons (including the Boston Marathon twice) probably helps. Why am I talking about Alison on the travel blog? Because visiting in Florida gives me a chance to spend a day hanging with a fellow soil scientist who has also become a good friend. Alison left Chicago and took a well deserved promotion to Florida and loves it. With a project office in Tavares, a beautiful new home in Eustis, near the charming town of Mt Dora, and a life filled with year round running routes, Alison is happy. Her husband Matt has settled in as well, teaching marimba and music from their home, although he does mourn the loss of easy access to university culture. With 8 days available for Bel I didn’t feel badly about taking a day on my own to drive south for a visit. Once again the open space of the roads around Ocala amazed me. Traveling east on 40 and then turning south on 19 led me through the Ocala National Forest and miles of traffic free highway. I passed Juniper Springs and Alexander Springs, remembering stories from Karen and Al’s blog about their camping sites in this part of Florida and day dreaming once again of the time when I will be here with Mo and the MoHo and the kayaks. It was wonderful seeing Alison, laughing about some of our shared soil survey stories, catching up on good inside gossip about fellow crew members and work in general as we walked around her favorite little sinkhole close to her home. The area has been fenced and protected and has a great trail around the ravine through some lovely habitats. Why we were walking enjoying the warm breezes, Alison came up with a line that I loved. “People say we don’t have mountains in Florida, but we do…they are just up in the sky.” She said that watching the huge cumulus clouds build in the afternoons always gives her the chance to look up and appreciate the scenery. Matt joined us for a drive to Mt Dora for lunch at the little French restaurant with a lovely patio and live music. Mt Dora is a storybook town, with surprising hills surrounding several lovely lakes lined with beautiful homes. Just down the road from the main part of town is the lakefront and boardwalk giving us another wonderful walk through the woods with views of the water. I still am trying to take photos of “velvet air” to no avail. I think a real photo challenge is getting a picture that evokes that feeling. Still haven’t managed it, but I keep trying. Mt Dora was quite busy on this Sunday afternoon, with many people shopping the cute shops and stores. The Christmas music was piped outside with strains of “White Christmas” serenading the 80 degree balmy weather. Floridians really get into the Christmas thing, and the decorations are everywhere. Must be all those retired New Englander’s missing their homeland, but not enough to actually go back and weather the awful winters. I found a perfect Christmas flag that has eluded me, a sturdy applique two sided flag with good colors. Even an internet search didn’t yield anything I wanted. I will hang it in the snow at Rocky Point and remember this warm, delightful afternoon in Mt Dora. Bel is doing well, medications are current, her health has improved a bit with the help of “Heart of Florida” in Ocala, and I had a chance to meet her neighbors and exchange contact information. Bel’s laptop is running well and she is getting used to using the mouse and Windows 7. She now knows how to get online, either in her back yard with a local internet from an agreeable neighbor, or a couple of miles away at Wendy’s. By the way, Wendy’s is a really great connection spot, none of that interface stuff that happens at McDonalds, and a really fast connection. I have learned to search out a Wendy’s when I need to get online and don’t want any hassles. Wish I had a connection that fast at home! I talk to Mo every day, and home has been uneventful. The night temps are in the teens with daytime highs in the low 40’s at best. I have enjoyed the break, the warmth, the sunshine, but I am ready to get back home to my real life. Time to haul wood, hug the dog and the cat, hang the flag, have cable TV and an internet connection again, and work in my home office in my pajamas.